The easiest part to obtain is the one page advertisement. I found the advertisement in a Go-Bots magazine (Spring, 1986). It is very likely that these can be found in other comics and children’s magazines from the same time period. 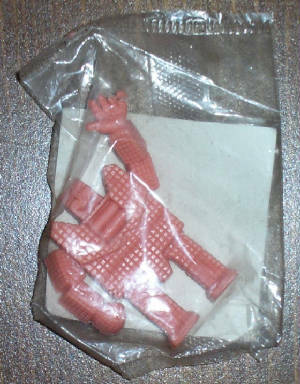 The second easiest part to find is the figure still wrapped in plastic. These tend to sporadically turn up on eBay. This is part of my Quik collection (they can all be seen at the bottom of the page). All of these figures were purchased very inexpensively. This picture is the front of the Nestle Quik tin, with a promotional splash. This picture is the back of the Nestle Quik tin, with a design that is very similar to the promotional ad that was in magazines. 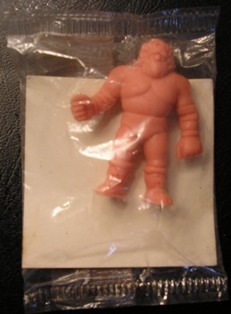 During the height of M.U.S.C.L.E. 's popularity (which wasn't very long) Nestle ran a simple promotion. 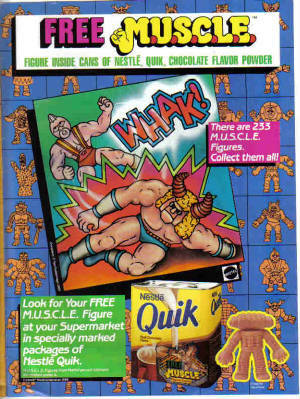 Inside each can of Nestle Quik there was a random M.U.S.C.L.E. There was nothing special about these figures. 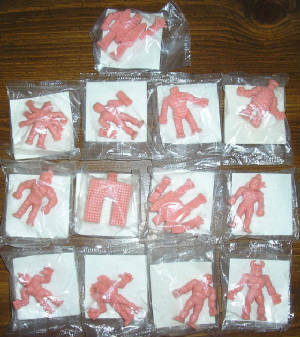 They were the same "flesh" colored figures that could be found in the 4, 10, and 28 packs. They only thing "special" about them were the fact that they were individually packaged on white cardboard with a protective plastic wrapper. 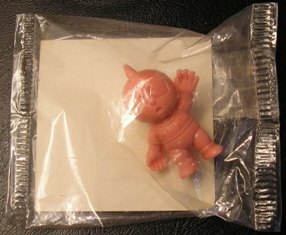 Once the figure was removed from the wrapper there is no way to differentiate the figure from a non-promotional figure. 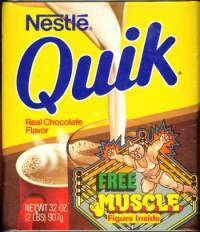 There are only 4 know aspects of the Nestle Quik/M.U.S.C.L.E. 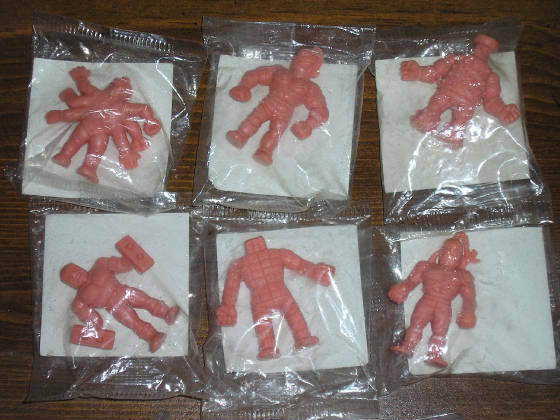 promotion: (1) the flesh figures wrapped in plastic; (2) the Nestle Quik can with the M.U.S.C.L.E. pictures on the front and back of the can; (3) the one page advertisement; and (4) the promotional figure tube given away at schools. 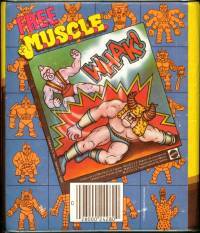 Personally I know two M.U.S.C.L.E. collectors that own the Nestle Quick can. Unfortunately I have never seen any other cans. 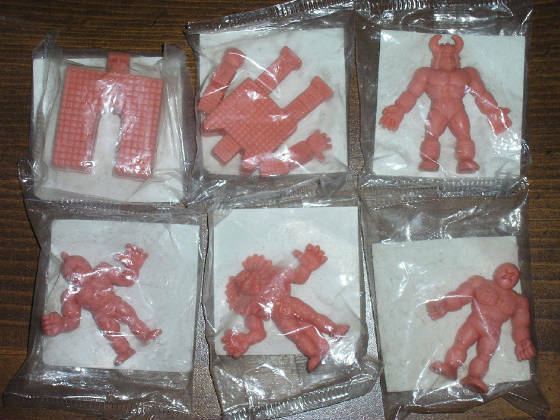 There must be some tins sitting in attics holding long forgotten collections of M.U.S.C.L.E's. If anyone has a can, then please contact me - I'm very excited to own one. The most obscure piece is promotional tube that was given out at schools. Children received a white tube, with "M.U.S.C.L.E" stamped, in blue, in a repeating spiral pattern (See Below). 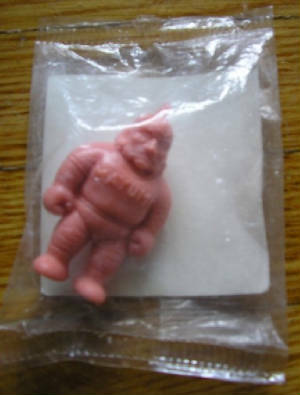 Inside were random "flesh" color figures. There is only one known example of these tubes. It is very unlikely that many of these tubes survived. They are fairly boring to look at, but fascinating over 20 years later. The above figure (#20) deserves a special note. Alex, arforbes, sold me this figure because he wanted it to be part of a larger collection. Alex has a very impressive collection and I was very humbled that he would want me to have his Quik figure. Thank you very much Alex!